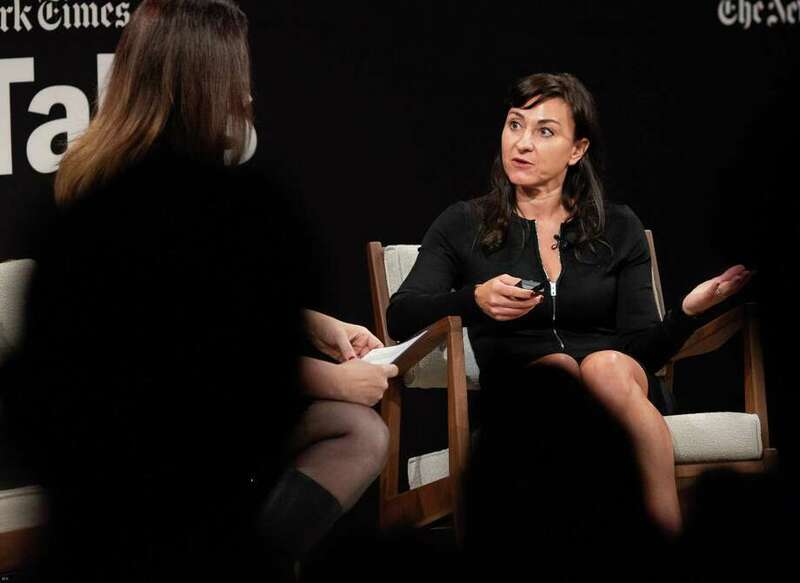 Westport native Lynsey Addario speaks with Rukmini Callimachi about photojournalism across the globe at a TimesTalks event at theTimesCenter in New York City on Oct. 5. NEW YORK CITY — For over two decades, homegrown Pulitzer Prize-winning photojournalist Lynsey Addario has documented life in conflict zones across the Middle East, South Asia and Africa. In a new book of photos, “Of Love & War,” Addario fans can buy, for the first time, a collection of her influential work from around the world. In her bestselling 2015 memoir, “It’s What I Do: A Photographer’s Life of Love and War,” Addario detailed her time growing up in town and coming of age in the post 9/11 era. Curiosity got her started as an international photographer and continues to drive her work today, Addario, a MacArthur Foundation Genius Award winner, told the audience at the Oct. 5 TimesTalks event hosted by the New York Times, where Addario regularly works. Although Addario may be best known for her photographs documenting the U.S. conflict in Afghanistan, she visited the country first before Sept. 11. “I was 27 years old, I couldn’t get an assignment to save my life, I saved my money, and I decided to go photograph life under the Taliban and what life was like for women, because I felt that was a story that wasn’t being told,” Addario said. Following the U.S. invasion, Addario returned to Afghanistan and found her gender to be an advantage for her work in the country. “I went and realized very quickly that my gender was an asset, that I could go into women’s homes, and I could see the way women were living because I was female,” Addario said. Her womanhood has at times presented challenges in the field, however, Addario said, noting that women often have to prove themselves longer than men. In 2007, Addario and New York Times correspondent Elizabeth Rubin asked to embed with the U.S. military in order to report on civilian casualties in Afghanistan’s Korengal Valley, where the U.S. was dropping bombs, but were told the valley wasn’t a place fit for women. She and Rubin convinced the military they could keep up with the male fighters and spent two months embedded with the troops, Addario said. “I think there’s still a pretty big double standard with this group,” Addario said, noting that she was heavily criticized for reporting in conflict zones while pregnant, when her male colleagues are not reprimanded for entering dangerous situations while they have young kids at home. Addario brushed away the notion she photographs in conflict zones for the adrenalin rush. “It’s not about the adrenaline. It’s about telling the story. It’s about being there. It’s about documenting history. It’s about bearing witness. It’s about giving a voice to all these people that don’t have a voice,” Addario said. Addario will speak at Christ and Holy Trinity Church, 75 Church Lane, on Oct. 29 at 7 p.m.